One Prayer That Will Help Other Prayers Succeed Quickly. 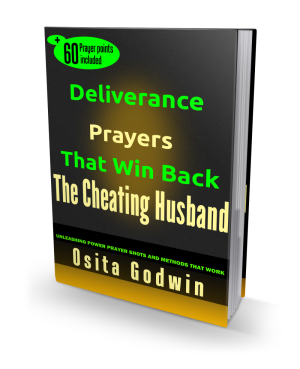 I want to say loud and clear that the long-expected eBook, Deliverance Prayers That Win Back The Cheating Husband, is finally out and roaring. I make this announcement again because I received about 37 inquiries, yesterday, on when the eBook will be out, and how they will get copies. I perceive that there are many more people who didn't know that the book is out. It appears many people didn’t receive (or read) my last post here…or perhaps I didn’t communicate the eBook release clearly enough. The eBook is now being actively distributed and received. It is offered at a very, very low introductory price of $5.99. You could view a report of the book at https://www.cheatinghusbandsecrets.com/change-your-cheating-and-lying-husband.html and also order your copy from there. Those who have difficulty in downloading copies of the eBook have to adjust their system settings or update their PDF software. However, if you still have issues, please mail me directly at prayerebook@cheatinghusbandsecrets.com, so that I may resolve the matter quickly for you. Finally, on this, I would strongly suggest that everyone gets a copy of this highly targeted and empowering eBook. Some of you mentioned the issue of persistent weakness, discouragement or ‘dryness’ at the time of prayer. If you miss your quality prayer time once, it may be excused but if it goes on for days, then the enemy is surely manipulating. The devil recognizes superior power in prayer, so his scheme is to disable your prayer life so as to continue the onslaught on your marriage. But it's so easy to deal with him so that you enjoy 100% prayer victory with this eBook. I will show you the prayer that will end that weakness and release prayer vigor. The Prayer That Makes The Other 77 Easy To Pray And Receive. You have 77 prayer points in this eBook taking on the evil spirits influencing your husband and troubling your marriage. ‘And these signs shall follow them that believe; In my name shall they cast out devils; they shall speak with new tongues’. The first thing we should do when we persistently face prayer weakness is to sanitize our prayer environment. The thing making you weak is in your prayer environment, not in your body! But don't just change prayer venue because it may disorient you. So before you go further in our prayers, cast out the devils in Jesus name! As you approach the prayer place, plead the Blood of Jesus and command the evil spirits out of your prayer life and circle. "Father, I’m grateful for all that you have given me for my victory and godliness. I appreciate your hand that’s always by me to confirm the words that you have given me. I believe that the power of the Holy Ghost is now in operation to dismantle every evil structure of wickedness in whatever form and to grant me unhindered access into the will of God for me. Now, in the Name of Jesus Christ, I stand to pray and release all the powers of resurrection and redemption available to me in God and I command every evil spirit and demonic presence assigned to disrupt or rupture my prayer life to leave this environment and never return. I call down the searchlight of God and the consuming fire of the Holy Spirit against the preparation of hell that's against the success of my prayers. From this time on, whenever I stand to pray I shall pray through. Any one or thing that stands in my way shall be crushed while I have victory. Thank you, my Father God, for I have prayed in the Name of Jesus Christ. Amen!" Now go and have it the way you want.